Millard Fillmore was the 13th President of the United States who served in office from July 9, 1850 to March 4, 1853. What was the life of Millard Fillmore like? The short biography of President Millard Fillmore covers important information and facts about his early life, his family, career and the famous events and achievements of his political life. Our short biography of Millard Fillmore provides an interesting and easy way to learn about the life of the President. The following important facts provide a fast overview of important facts about President Millard Fillmore. Facts and Info: Millard Fillmore was the 13th president of America known for his approval of the Compromise of 1850, which allowed slavery in the South. This law failed as neither the North nor the South was happy with it. For additional info refer to 20 Facts about Millard Fillmore. Facts and Info: Millard Fillmore was born in a log cabin on January 7, 1800 in Moravia, Cayuga County. His parents were Nathaniel Fillmore and Phoebe Millard. He was as the second of nine children. His parents were not wealthy and he was raised living on the frontier. From these humble beginning Millard Fillmore rose to the highest position in the land. Millard Fillmore died in Buffalo on March 8, 1874. Facts and Info: The career of Millard Fillmore included the roles of Lawyer, Politician and Statesman. He struggled to get a good education living on the frontier and was apprenticed to learn the cloth-making trade. He eventually attended New Hope Academy, studied law and was admitted to the bar. He then entered a successful career in politics. His term of office as President commenced following the death of President Zachary Taylor who had served for just 31 days before he died on July 9, 1850. Millard Fillmore became the 13th President of America in 1850 and served for 3 years until 1853. Facts and Info: Millard Fillmore married Abigail Powers on February 5, 1826. At the age of 23 she took up a teaching post at Hope Academy. One of her pupils was 19 year old Millard Fillmore. Gradually their relationship of teacher and student evolved into a romantic liaison. The couple had two children, Millard Powers and Mary Abigail. Due to her delicate health the First Lady entrusted many routine social duties to her daughter "Abby." Abigail Powers died just 26 days after leaving the White House. Five years later Millard Fillmore married a wealthy Buffalo widow called Mrs. Caroline Carmichael McIntosh. Facts and Info: Millard Fillmore belonged to the Whig Political Party. The Whig political party operated from the early 1830s to the mid-1850s in opposition to the Democratic Party and favored a program of modernization, economic protectionism. He was 50 years old when he was inaugurated as the 13th president. Inauguration is a President's swearing-in ceremony. Fillmore didn't make an Inaugural Address. Millard Fillmore ran for president in 1856 but lost the election. For additional facts refer to his Presidential Cabinet members. Short Biography of Millard Fillmore: What he was like! Facts and Info: He was 5 feet 9 inches in height with a heavy build. He had unruly brown hair which turned white as he aged, blue eyes and a fair to ruddy complexion. He dressed immaculately in dark suits. He founded the private University of Buffalo and established the first permanent library in the White House. Fillmore's wife had the first "running-water bathtub" installed in the White House. In Congress, he opposed admitting Texas as a slave territory and during the Civil War, Fillmore opposed President Lincoln. Facts and Info: During his presidency he played a key role in important events of the era. 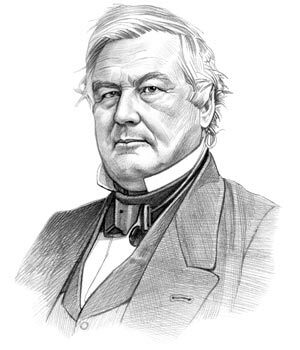 Millard Fillmore was instrumental in establishing the Compromise of 1850 which consisted of five bills which defused the arguments about territories between the slave states of the South and the free states of the North thus staving off the confrontation that would eventually lead to the Civil War. In terms of foreign policy Fillmore instructed Matthew Perry, the Commodore of the U.S. Navy, to embark for Japan in search of a Japanese trade treaty with the West which would provide important trading opportunities. Facts and Info: Millard Fillmore died of a cerebral hemorrhage in Buffalo on March 8th, 1874 at the age of 74. His funeral was held at his mansion and a procession took him to Forest Lawn Cemetery. Both his wives and a daughter are interred with him. The short biography of Millard Fillmore provides a fast overview of the key facts and events about his life and the accomplishments of his presidential term in office. The following Millard Fillmore video enables you to sit back and listen to the history of his personal and political life - a useful educational resource for kids, children and schools learning about the life of President Millard Fillmore.